Once in a while, I come across a band that’s non-local to us, but who I just can’t resist. Back in January, I came across one of those bands – Daze One. Because of commitments to other artists, I held off on writing about these guys until now. But I feel bad. Everyone should have heard about them a long time ago. Daze one hails from Brighton, England, and the members are all in their late teens. You’d never guess how young these guys are if you heard them. They have a sound that’s well beyond their years, vocals that are unbelievably mature, and lyrics that are amazingly complex for such a young band. Daze one is Clark Maides with vocals and guitar, Richard Rigby on guitar and background vocals, Sam Irvine on bass, background vocals and sampler, and Ben Coleman on drums. Despite their ages, the members of Daze One have been playing together for about five years. They’ve all known each other all of their lives. Perhaps it’s that connection that they’ve formed over the years that allows them to produce such beautiful music, and to be one of very few bands to progress to their level after starting as essentially children. They’ve even won Best Unsigned Demo for BBC Radio1. Daze One has some of the most beautiful melodies I’ve ever heard, and they’re sure to get stuck in your head. The group pulls their influences from bands like Coldplay and Radiohead, and their music is definitely along those lines. The band took some time to answer a few questions. AX: What brought each of you into music in the first place? Is there anything that you want people to be able to take from your music? Daze One: Clark was listening to music before being born, mainly life-long hero Prince. This formed a lifelong affinity to the stage. Richard first picked up a guitar at the age of 11 to attract the ladies, but soon found that he could find more enjoyment by writing songs that didn’t show off individual talent, but a collective emotion. Sam started as the keyboardist, but quickly crossed over to bass guitar. Saying that, he still finds time to play keys in a couple of Daze One’s songs. Ben started off hitting pillows with chopsticks. Over time, the pillows got replaces with a drumkit, and the chopsticks got replaced with drumsticks. 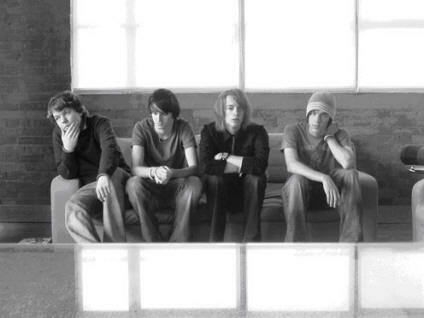 When the band first started, it was casual and easy, due to the fact that we were already really good friends. … We would like the fans to be able to connect to the music and enjoy it. If it lightens their day, we’ve done our job. AX: What do you feel sets you apart from other artists? Daze One: People get our melodies stuck in their head, and we feel that people of all ages can enjoy our music and our performances. We’ve never restricted ourselves to one particular audience. AX: Can you describe a little bit about what the music scene is like for you in the UK that you think would be different than here in the US? Daze One: I think the music industry is generally quite hard to break at the moment, UK or US. However, I think our sound would go down well in the US, as we take a lot of influence from Coldplay. Also, the success of British bands in the US this year (Franz Ferdinand/Snow Patrol) is well documented. It would be great to follow in their footsteps. Chris Martin described the states as “the holy grail” for British bands, and we believe him! Personally, I’d have to say that I’d love to see Daze One make it in the US. British bands never seem to be out of fashion here. And since they’re all still relatively young compared to most artists of their level, they’ve got plenty of time ahead of them to do just that. The most unfortunate thing about featuring non-local artists here is that we don’t really have the option of just hopping on a plane to catch a show. Believe me, if I could, I would … and hell, I’d take you all with me, because these guys are really that damn good. And as equally unfortunate, their latest EP isn’t available for sale here. However, the band’s got you covered. If you want to know more about Daze One, you can check out their website, which is quite comprehensive. You can download tracks, view pics and even download some home movies from the band. You can check it out at www.dazeone.co.uk.